Some people are just a little bit fancier than others. An interesting place where these differences tend to appear in a more visible way is the kitchen. Are you a dinner family or a supper family? Is your house strictly a butter tray/butter dish kind of house or are you living in a tub household? Perhaps the most divisive of these telltale issues is whether or not you have or want a dedicated TV in your kitchen. TV has become such a consistent part of American life that some people don’t ever eat without the TV on! Television shows have gotten so much better over the last 20 years. There has probably never been a better time to be watching television. 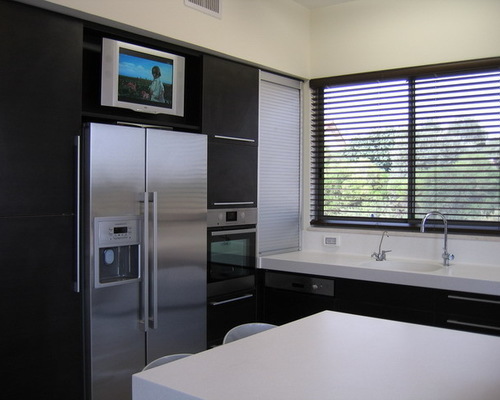 It only makes sense that more and more people would want the convenience of having a dedicated TV installed into their kitchen. Many people prefer to keep the TV out of the kitchen. For some tub and supper families, having the TV in the kitchen is probably priority number one while the look of the TV and how it fits into the kitchens aesthetic, comes in at a distant second. If you just have to watch that TV while cooking and eating in the kitchen, you should at least try to make the TV blend in with the rest of your cabinets and appliances. 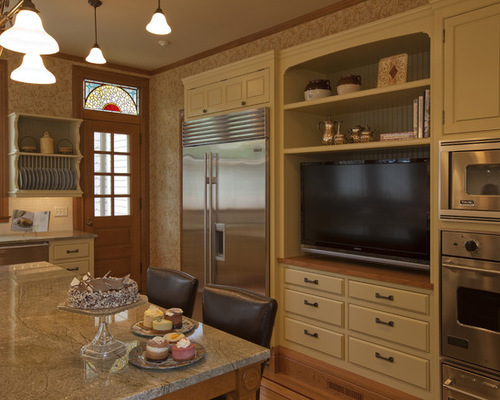 Here is a quick list of ways to accomplish that subtle kitchen TV. There are a lot of small flip down TVs that work in kitchens. These are the same kind of TVs that you can install into cars that are designed to be flipped down into viewing position. They can install in the ceiling of your car to keep your kids from making you want to drive off a cliff, and they can also install into the bottom of a wall cabinet. The only major problem with these useful little TVs is that the very design feature that makes them so discreet is also what keeps them from being big enough to truly enjoy watching movies or programs on. The easiest way to install a decent sized TV in your kitchen without it being super tacky is to place it in a microwave cabinet. All good RTA cabinet companies offer a special wall cabinet that has a small storage cabinet and a large open shelf area designed for a decent sized microwave. Most of these cabinets are about 27 inches wide. This means that depending on your TVs aspect ratio, you should be able to fit a 28-32 inch television into the space where the microwave was meant to go. Not too shabby. 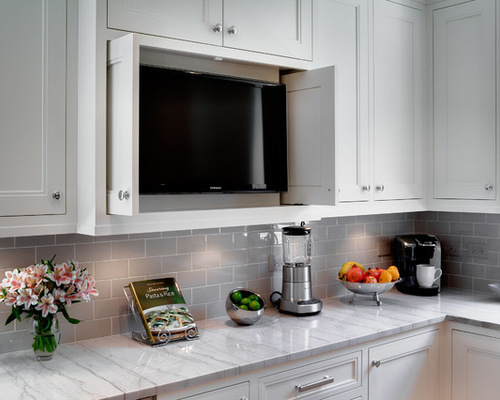 Probably one of the best ways to incorporate your TV into your kitchen is to install it above the refrigerator in place of the cabinets that would otherwise go there. 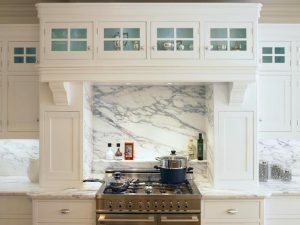 When designing the layout of kitchen cabinets, the shorter wall cabinets that go above the refrigerator are some of the more frustrating items to deal with. Unless you are designing a kitchen for someone who is 6’5” or taller, the cabinets above the refrigerator are hard to access. If you go with 24 inch deep cabinets, they will hold more items, the doors will be easier to open and access, and the cabinet will be flush with the front of the refrigerator, but unless you are super tall, the cabinet will become a black hole of the kitchen and you’ll never see the items in the back ever again. 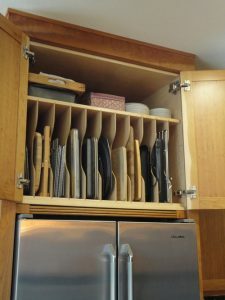 If you instead decide to save money and get 12 inch deep cabinets that you just plan to never really use, then you are still wasting some money on those cabinets. 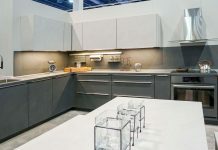 You will probably end up putting a bread box or a mixer or something on top of the refrigerator in the 12 inch space blocking the cabinets all together making them a truly vestigial part of your kitchen. 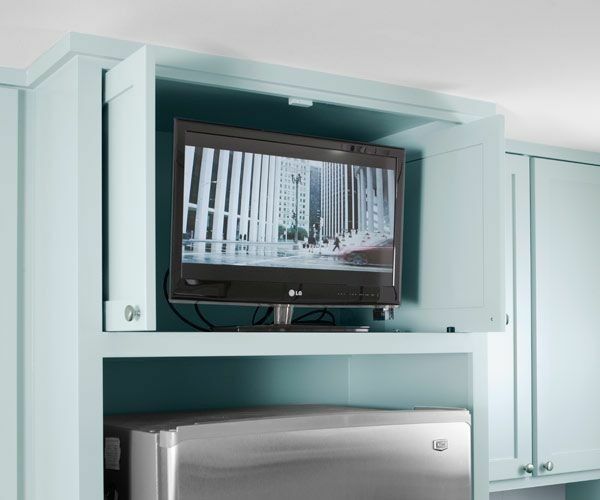 By building a small space where your TV can be installed above the refrigerator you make good use out of the frustrating cabinet area. Some people place microwaves in that space but it is not convenient to shorter people who have to access it all the time and pull out bowls of hot soup above their heads. By placing a TV in that space you can control what you are seeing by remote control so you practically never need to physically access the TV unit itself. So it’s kind of a win-win. A similar idea to installing above the refrigerator is to install the TV at the top of a stack of wall mounted appliances. One of the best features of slightly larger kitchens is to have a wall mounted oven (or ovens) with a separate cooktop rather than a range. Usually kitchens that are set up this way will have either a double oven, one stacked on top of the other, or a single oven with a microwave stacked on top of the oven. Both can look great if done well. If you take the time to professionally install a TV on the top of the stack, it can really fit well into the kitchen without being tacky. The only reason I prefer the “above-refrigerator” idea over the “above-wall oven” idea, is that the cabinets above a refrigerator are practically useless. The cabinets above a double oven are usually several inches (sometimes even a foot) lower to the ground; so your TV is now taking the place of useful deep pantry cabinets. To some this may seem like a non-solution, but in some houses, the best way to have a TV that you can watch in your kitchen is to have a TV in the next room over that is large enough and loud enough to service the kitchen. 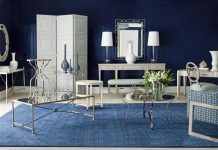 This solution will only really work in a house with an open floor plan where your kitchen shares space with a living room or dining room. 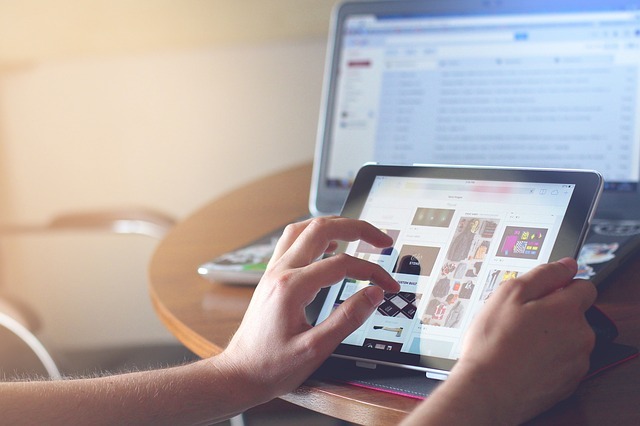 As the cogs turn within in our beautiful capitalist society, technology continues to grow, change, innovate, and become increasingly affordable. If you want a discreet TV in your kitchen, a possible solution is to simply have a dedicated kitchen tablet computer. Amazon was selling their Kindle Fire for $50. At the time, Amazon’s commercial joked that for that price your family can have a dedicated bathroom tablet. The same principles apply to a kitchen tablet. This may be unsatisfactory for more than 2 people to watch TV or movies on, but just about any other purpose for the tablet or TV in the kitchen would be satisfied with this solution. 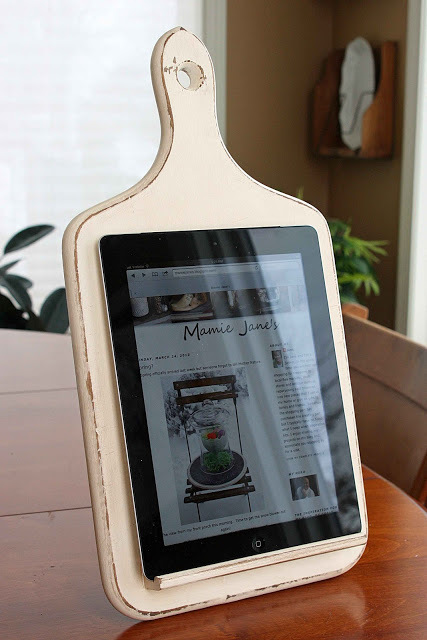 In fact many kitchen products are incorporating tablet stands into their designs now that so many people are using them in place of cookbooks and recipe notes. With TVs getting thinner and smaller it is becoming easier to have a dedicated kitchen TV. As it gets easier to have TV integrate seamlessly into our kitchens, it makes it that much more tacky and lazy to simply place a TV on your countertop in your kitchen. If you just have to have that convenience of the kitchen TV, I hope that you will find a classy way to pull it off.